← What Are You Doing to Reduce Sugar? 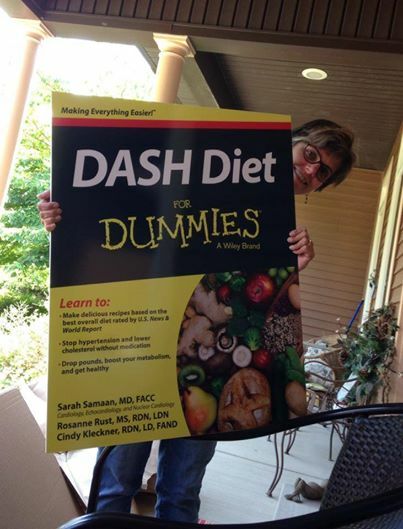 AD: My newest book, DASH Diet For Dummies® will hit shelves in the next couple of weeks. The DASH Diet is a lifestyle and meal plan that is proven to reduce blood pressure, and can also be effective for weight loss and blood sugar control (supports diabetes treatment). DASH Diet is not a fad diet, but a dietary plan based on the Dietary Approaches to Stop Hypertension clinical trials. The book provides you with all of the background on the research, as well as the true-to-life tools you can use right away to incorporate the diet into your lifestyle. I co-authored the book with cardiologist Sarah Samaan, MD and registered dietitian and culinary expert Cindy Kleckner, RDN. Our team has done a great job at delivering information about the physiology of the heart with key, easy-to-understand information about heart disease, as well as kitchen tips and simple recipes to try in your own kitchen. Do consider purchasing a copy (Kindle or paperback) to help you understand your heart health and healthy eating. Anyone, any age, can benefit from the information in the book, but it is especially useful if you are 40 years old or older, have heart disease, high blood pressure, high cholesterol or diabetes, or any family history of these disorders. Follow us on Facebook at Dietitians with Heart, or visit my new author page. You can check out a preview here, and you can also review some online tips. Let us know what you think! This entry was posted in Book Review, Easy Cooking, Food Facts, Heart Disease, Misc, Weight Loss and tagged cookbook, dash diet, Dietitians with Heart, easy recipes, health, heart disease, heart health by Rosanne Rust. Bookmark the permalink.